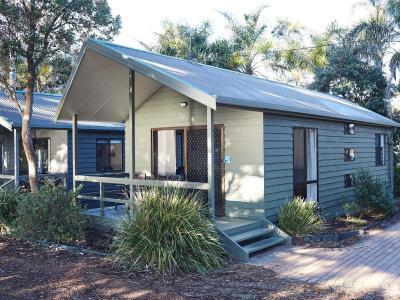 Lock in a great price for NRMA Murramarang Beachfront Holiday Resort – rated 9 by recent guests! Loved the ocean front spa villa, nice sized kitchen and bathroom and a view to die for! Comfy bed. Large spa. Beautiful location. The seats on the front porch were great. We sat and watched the water and the kangaroos. 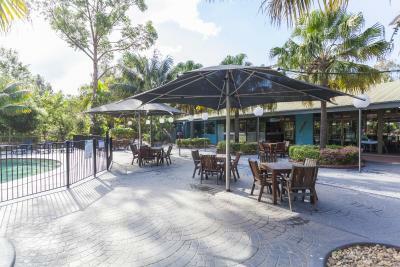 The peace and quiet, the food at restaurant. The walks and the wildlife. 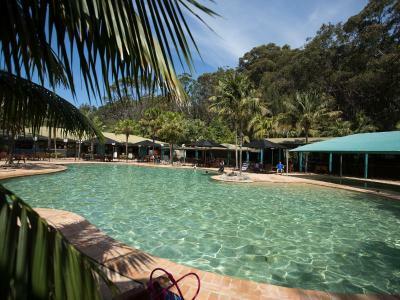 Breathtaking beaches, Great cocktails, amazing wildlife (aka kangaroos everywhere), friendly staff and delicious food served near the pool. 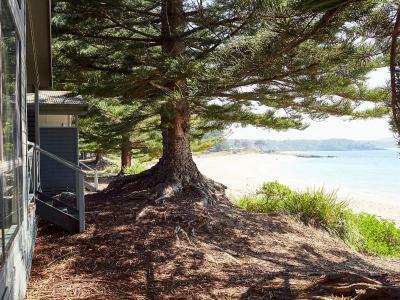 Beautiful location facing north - beach and surrounds were fantastic. Local wildlife was an added bonus! Attended a wedding at the bistro and we were beyond impressed of how the whole thing was put together. The food was fantastic and the staff were so attentive. The girl behind the bar was extremely personable. Our forest cabin had everything we needed. Clean. Loved the beach being so close. Lots of wildlife. 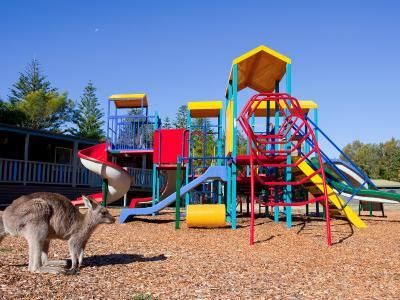 Great family holiday spot. It has a beautiful view of yhe sea and close to home. My 2nd time to stay... Just love the place. Very good for families. 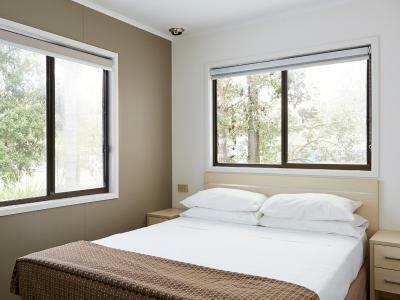 Rooms well equipped with aircon to keep you cool and everything you need. 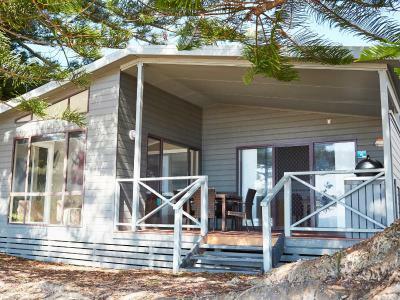 NRMA Murramarang Beachfront Holiday Resort This rating is a reflection of how the property compares to the industry standard when it comes to price, facilities and services available. It's based on a self-evaluation by the property. Use this rating to help choose your stay! 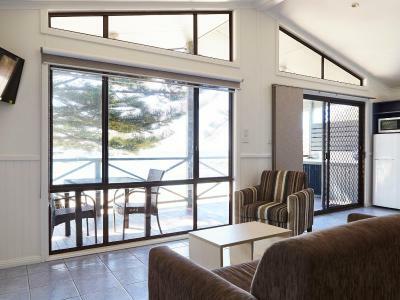 NRMA Murramarang Beachfront Nature Resort offers beautiful beachfront accommodations, overlooking the beautiful Beagle Bay. 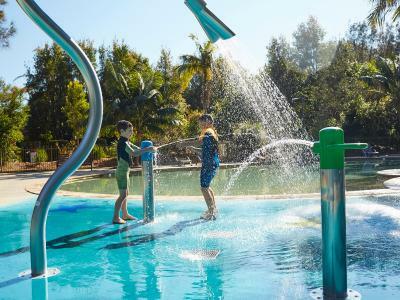 This holiday park features a huge resort pool and kids splashpad, surrounded by a modern bar and outdoor seating. Skippy's Takeaway is perfect for quick meals and great coffee, while the Beach Bistro serves up delicious meals accompanied by a huge selection of wines and tap beers. 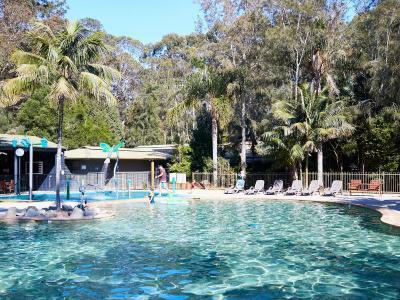 Located in South Durras, Murramarang Beachfront Nature Resort is 15 minutes’ drive from Batemans Bay. 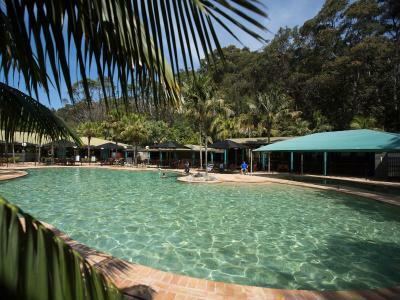 Adventurous bush walkers and mountain bikers will love exploring the surrounding National Park. 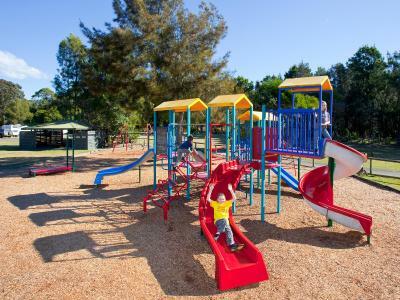 Canberra City Center is 2 hours’ drive away. 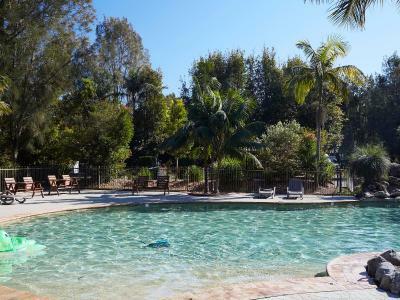 Accommodations options include bungalows, villas, and beachfront cottages. 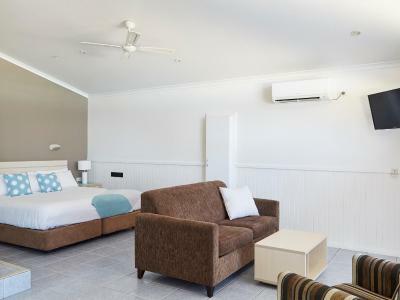 All accommodations is air-conditioned and includes a flat-screen TV. Some feature a refrigerator and a microwave. 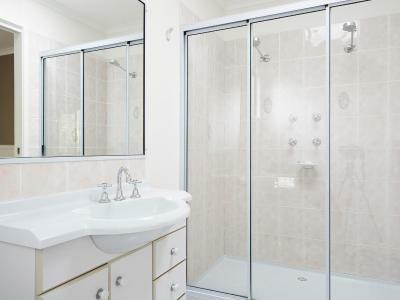 The private bathrooms offer a shower and a hairdryer. 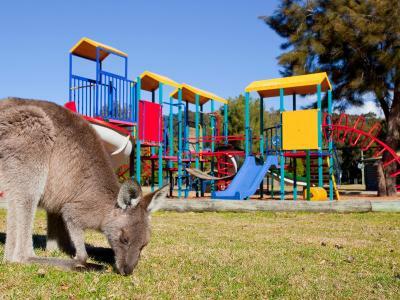 Guests at this tranquil retreat can relax on their private patio and enjoy an array of local wildlife including kangaroos. 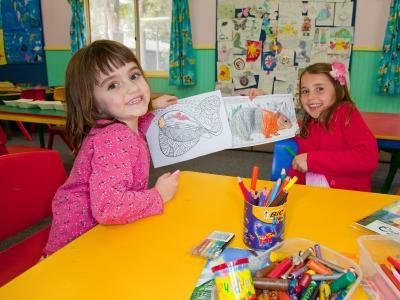 The property also offers a kids club during school holidays and long weekends. 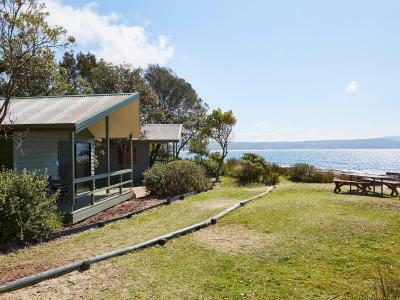 This property is also rated for the best value in Durras! Guests are getting more for their money when compared to other properties in this city. 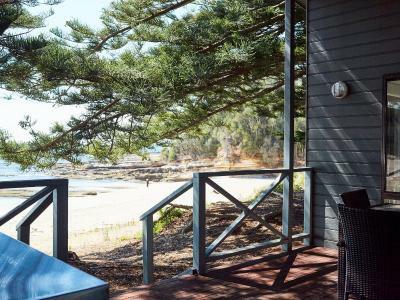 When would you like to stay at NRMA Murramarang Beachfront Holiday Resort? 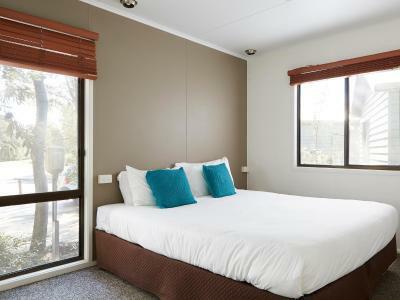 This house has 1 queen-sized bed, 1 double-sized bed with 1 single bunk bed and 1 sofa bed. 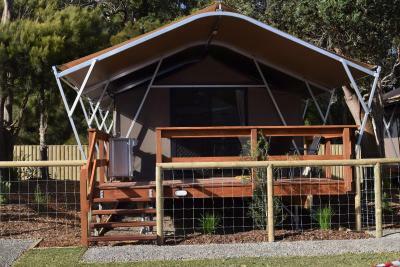 It also includes air-conditioning, heating and a kitchen with a stove top, oven, dishwasher, microwave and a refrigerator. 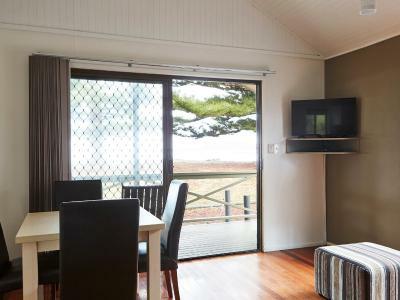 There is a dining area, bathroom, washing machine and a veranda with outdoor dining and a barbecue and a seating area with a sofa, TV, cable channels and a DVD player. This villa includes 1 king-sized bed. It also includes air-conditioning, heating and a kitchen with a stove top, microwave and a refrigerator. 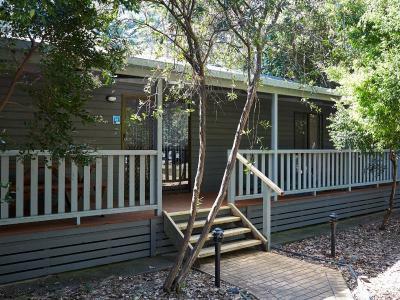 There is a dining area, bathroom with a spa bath and a veranda with outdoor dining and a private barbecue and a seating area with a sofa, TV, cable channels and a DVD player. This villa includes 1 queen-sized bed, 1 single bunk bed and 1 sofa bed. It also includes air-conditioning, heating and a kitchen with a stove top, microwave and a refrigerator. 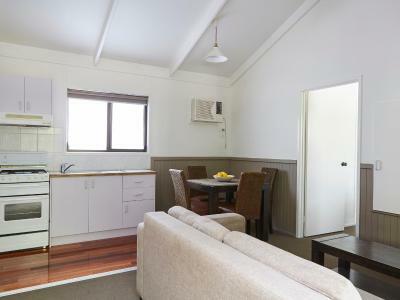 There is a dining area, bathroom, and a seating area with a sofa, TV, cable channels and a DVD player. 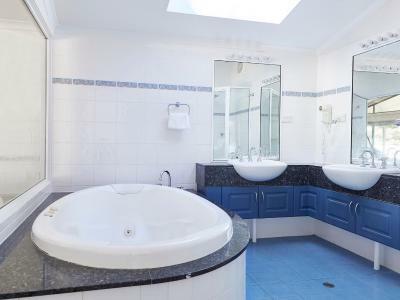 Some villas have a bath. This villa includes 1 queen-sized bed, 2 single-sized beds and 1 sofa bed. 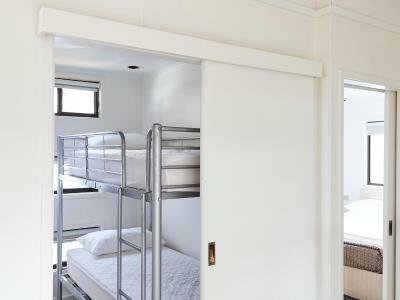 It also includes air-conditioning, heating and a kitchen with a stove top, microwave and a refrigerator. 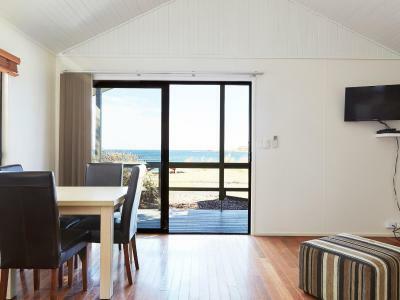 There is a dining area, bathroom with a bath, a veranda with outdoor dining and furniture and a seating area with a sofa, TV, cable channels and a DVD player. 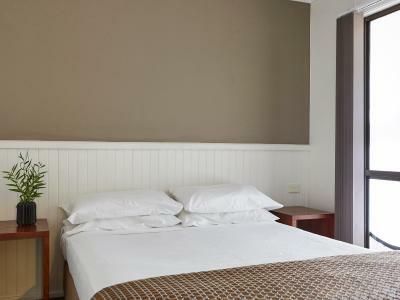 This villa includes 1 queen-sized bed and 2 single-sized beds/1 double-sized bed, on request and 1 sofa bed. It also includes air-conditioning, heating and a kitchen with a stove top, microwave and a refrigerator. 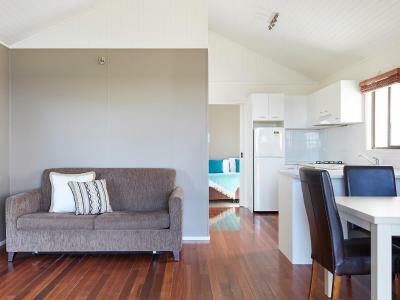 There is a dining area, bathroom with a bath, a veranda with outdoor dining and furniture and a seating area with a sofa, TV, cable channels and a DVD player. 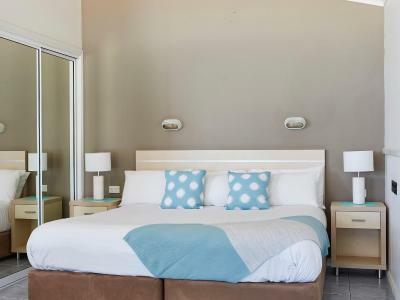 This villa includes 1 queen-sized bed, 1 double-sized bed, 1 single bunk bed and 1 single sofa bed. 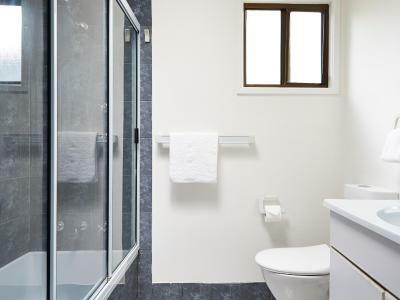 It also includes air-conditioning, heating and a kitchen with a stove top, convection microwave and a refrigerator. 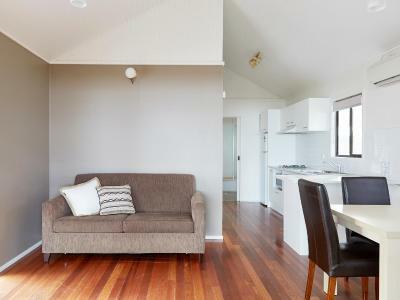 There is a dining area, bathroom with a bath, a veranda with outdoor dining and furniture and a seating area with a sofa, TV, cable channels and a DVD player. This cabin has 1 king-sized bed and 1 sofa bed. It also includes air-conditioning, heating and a kitchen with a stove top, microwave and a refrigerator. 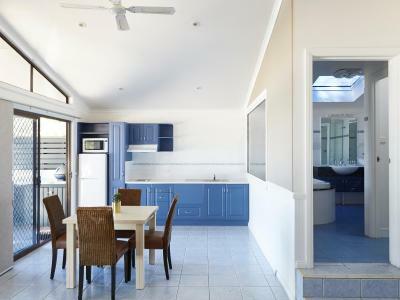 There is a dining area, bathroom with a spa bath, a veranda with outdoor dining and furniture and a seating area with a sofa, TV, cable channels and a DVD player. This air-conditioned tent features garden views. 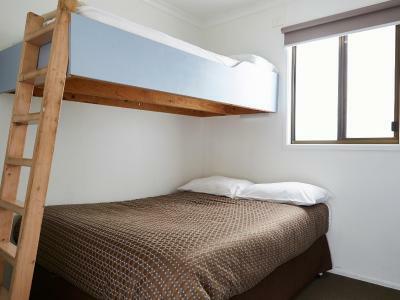 There is a queen bed and a single bunk bed. A kitchenette with a microwave and fridge is features. 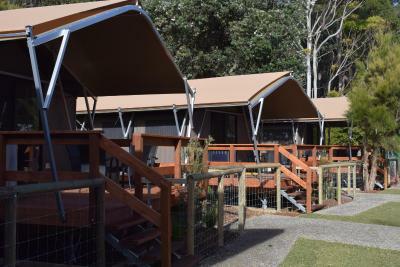 The tent includes a dining area, bathroom and a veranda with a BBQ, outdoor furniture and dining area. Relax on the sofa with a TV. 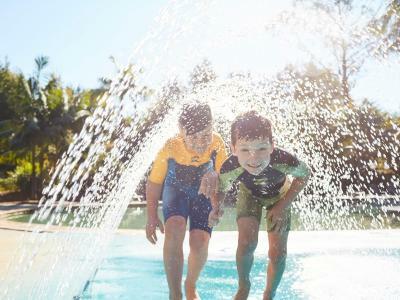 House Rules NRMA Murramarang Beachfront Holiday Resort takes special requests – add in the next step! 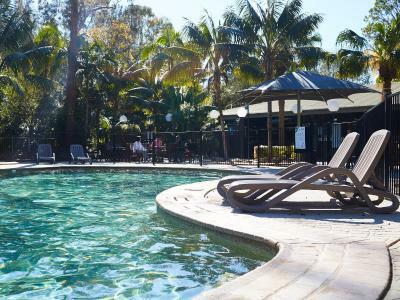 NRMA Murramarang Beachfront Holiday Resort accepts these cards and reserves the right to temporarily hold an amount prior to arrival. 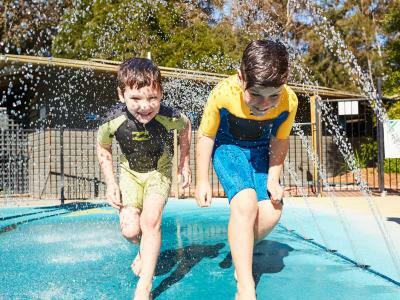 Please inform NRMA Murramarang Beachfront Holiday Resort of your expected arrival time in advance. You can use the Special Requests box when booking, or contact the property directly using the contact details in your confirmation. The exhaust fan in the bathroom needed a clean and shower wasn’t great. There was no lock on the bathroom window. There was no fan in the bedroom which was quite hot. An outside tap to wash sand off our feet would have been good. Couldn’t sit on the lounge as it when to the ground. Shower floor had a large hole in the floor that was not fixed so it still had sharp edges on it. Roof of bath room in main bed room had mould on it. 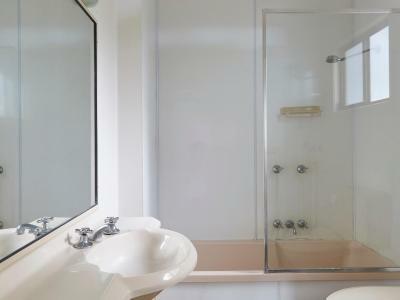 The other bathroom had mould around the bath. 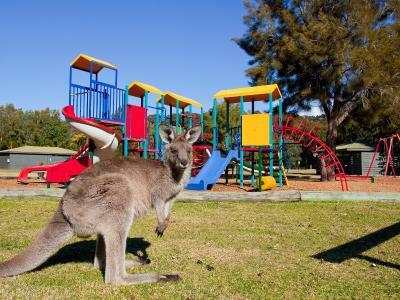 Then we get to the kangaroos big problem. Our two year old had a piece of bread that she was eating standing on the steps of the cabin to then be confronted by a roo trying to eat the bread out of her mouth. Luckily we were close when it happen. We then couldn’t let her out the door unless we were right then. They need to do something about the Roos. Having afternoon cocktails by the pool was bliss! It's a great place ! 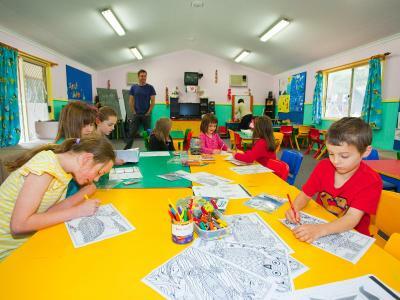 Not very clean, rooms not child friendly and lack of activities. Takeaway could stay open later during holidays. Our cabin was noisy with some sort of water pump going 24/7 outside our cabin, we couldn’t keep our windows open and we were hot during the night. The tap water smelled like bore water. Informed and got better for a couple of hours but same problem persisted.